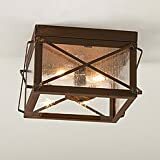 Primitive Double Ceiling Light With Bars is handcrafted in Pennsylvania by Irvin\'s Country Tinware. Comes direct wired with two common sockets, 60 watts max. per socket. Please note this light is open on the bottom. Rustic Tin finish comes with Seedy Glass. This light is UL listed and has a 5 12 months promise. Practical and decorative are what we use to describe this ceiling light. 60 watt max. bulbs give a lot of light in a hallway or a bedroom.